A new book has transformed the art of making bread, so that you can literally make a beautiful, delicious loaf in five minutes a day — no kneading required, and no starter to feed. The book, Artisan Bread in Five Minutes a Day, includes a recipe for a “batch” that makes up to five loaves that you store in your refrigerator until you’re ready to bake. Just pull off what you need for the day, and bake; the rest stays in the fridge. Once you have taught your children this simple art, they will never be a starved college student. With a few dollars, pooled together from their buddies, they can get themselves some yeast, flour and cheese, and create a terrific meal for themselves and their friends. Cheaper than pizza, this method is so simple, you could make this in a college apartment, no special tools required. You’ll be making more loaves than you thought. My first loaf came out of the oven, and I headed for my camera to take the picture – it was such a beautiful specimen. 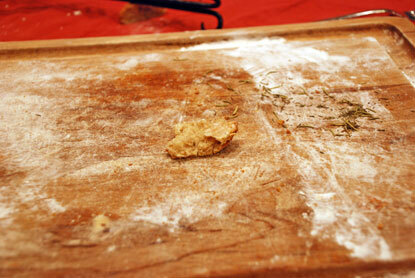 I came back to the kitchen to find this one lone crumb. Hands-Off Until It’s Cooled. Fresh bread out of the oven is tempting. Your kids, and spouse, will give it maybe five minutes at most to cool, at most. Just cool enough to grab it and pull it apart just to watch the steam come out of those hollow holes inside. Teach them to wait. Opening the bread while it’s too warm will collapse the bread. 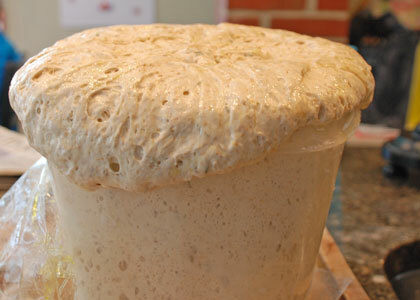 The texture of the bread will improve dramatically if your family can learn to be patient. While most bakers insist on a scale, this method demands that you scoop and level the flour. The recipes are “built” into this method. Train them. 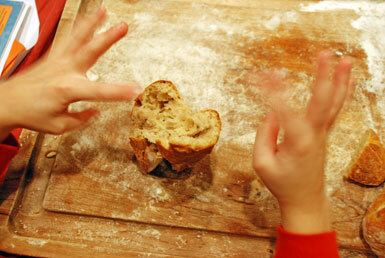 Truly, this bread-baking process is simple enough for an 8-year-old to easily master. So, go ahead, teach them how to pull out the dough for the day, shape it, and let it rest for the twenty minutes. You can step in to help when it’s time to build the steam in the 450-degree oven. I waited for the book to show up at the library, got tired of waiting and ran to Barnes and Noble. Of course, the book was sold out, so I had to wait for the special order. The day it arrived, I fought ice and snow to get the book, toddler in tow, whining for the Batman Comic books, and we enjoyed our first freshly baked baguette that night. i am sooooo getting that book!! my kids love homemade bread. i don’t mind making it! i love fresh challah. but…that bread sounds delicious! hope you have an awesome valentines day! Ooh, I am checking that out of the library tomorrow! I tried making starter a few times but couldn’t get it to work. I think I’ve got buttermilk biscuits down finally, so now it’s on to bread! No starter to feed… amazing. Sounds delightful! Your family are lucky! You are SO dangerous, Susie. I’m adding this book to my must get list. Thanks. Hot buttered bread is like heaven. I could live off of bread, butter, and cheese alone. Well, maybe a little wine, too. I agree… I could even skip the butter if I had good cheese. OMG that looks delicious!! I just wish I wasn’t on this diet!!!! I love breads! I used to make them when I had a bigger kitchen. Your photos of the bread is fab! Man, I’m getting Homer Simpson flashes. Grace… trust me… No counter space needed for this. My husband bakes all our bread by hand. Waiting for it to cool is definitely the hardest part! Your post made me hungry, all the fresh bread looked delicious even the one lone crumb. Not feeling up to doing my own list this week, but wanted to wish all my fave 13ers a Happy Valentines Day 🙂 Now I’m going to go and get me some fresh bread! Yum! Ever since my bread maker broke, there had been something missing in my life. No joke! I have to get this book. OMG! I’m getting this book! I purchase frozen dough, but this sounds even better! Thanks for sharing! Forget the breakdmaker! All you need is a spoon! I love homemade bread! Yummy! 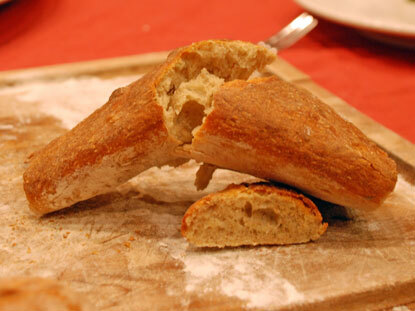 Yum … I love fresh homemade bread! Well that looks just scrumptious! I might just have to pick that book up! i’ve done the “no-knead” bread from the times, but this is way intriguing. Dang, I am soooo getting this book! Thank you so much! Fantastic bread! Thanks for sharing how to make it, susie! Oh yummy! I have a planned trip to the bookstore tomorrow…hmmmmm….thanks. Susie, I just had to let you know that my book arrived and I’ve already made 4 loaves! OMG this is amazing. Bad for my diet, but delicious! Thanks so much for sharing about it–I’d never heard of this method before your list. 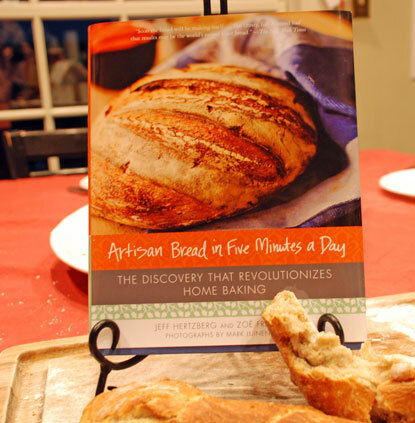 I’m Jeff Hertzberg, one of the co-authors of Artisan Bread in Five Minutes a Day. I’m so glad our recipes are working well for you. Come visit us anytime at http://www.artisanbreadinfive.com, where you can post questions into any “Comments” field, or click on “Bread Questions” on the left side of the homepage and choose among the options. Yay! I knew I had seen this, but I couldn’t figure out why I couldn’t find it when I went looking for it earlier this week! I’m always looking for new/easier ways to make bread instead of buying it all the time for my family! Now I know WHY I couldn’t find it!!! 😀 (I looked in my bookmarks instead of the blogs in my blog reader! LOL! Love this! I have a book about making bread, and it isn’t this easy! I am checking it out at the library asap.